"It's not just the cars...It's the people!" KC Golf Cart Company is the official golf cart provider for Circuit of The Americas. To reserve a golf cart for this event please visit their website at www.kcgolfcartco.com. Reservations must be completed and paid for prior to the event in order to guarantee a cart will be available. Please provide a drivers license and a credit card for incidentals when picking up your golf cart. All golf carts will be gas powered with headlights and a roof. For any questions or concerns please contact Andy Leiker by email at andy@kcgolfcartco.com or by phone at 913.745.4665. Go to Carrera of the Americas PCA Club Race *Password Protected and click. Then click on "Enter Protected Area"
Then type "pcacota" - All lower case. You WILL NOT need to provide KC Golf Cart Co. with a certificate of liability insurance, even though it is stated on the website that you do. COTA sells Premium 93 Unleaded and 101 Octane Unleaded Race Fuel at the fuel pumps between the two Paddocks. Credit or Debit Cards only. This fuel is stored in underground tanks. 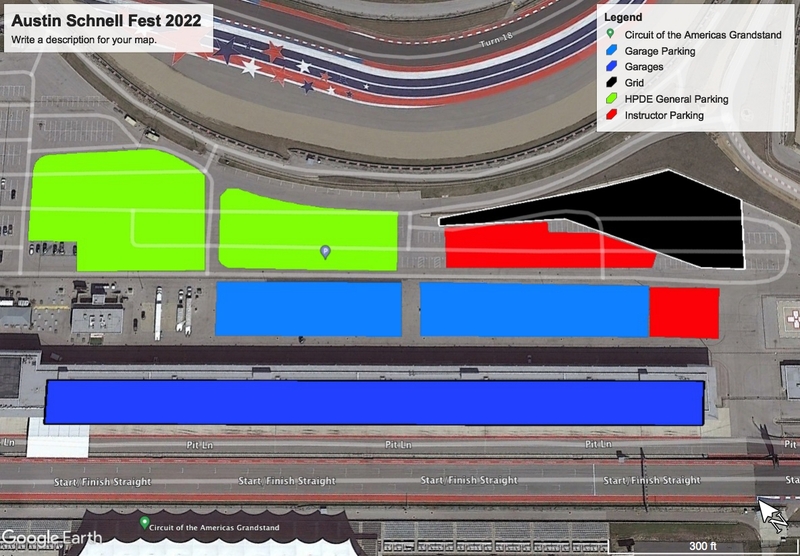 In addition, participants may bring their own fuel in 5 gallon containers (Note that COTA prohibits the refueling of cars inside the garages). Also, there is an Exxon gas station just to the east of the main entrance to COTA on Highway 81. COTA will erect LARGE BRIGHT YELLOW CONTAINERS, at various locations in the paddocks, a number of collection facilities for used fluids and waste materials. Participants are required to make use of these for all waste materials. Spills of damage causing fluids such as oils, hydraulic and brake fluid and gasoline etc. may occur. All spills must be treated immediately. Please contact one of our Marshals immediately. Grand Prix Garage Information: The Formula 1 Garages are available for rent on the Registration site (clubregistration.net). Garages are 20 feet wide x 65 feet long (or 6 meters x 20 meters). Garages are equipped with 120v outlets, 220v, 30 amps, 60Hz. Private bathrooms, Epoxy floors. Compressed air hookup (no hoses). Double automatic lifting garage doors. Garages permit multiple cars in each garage. Participants place up to 6-8 cars in a single garage. Available directly through Circuit of the Americas. Located trackside between Turns 11-12. You know you're a racer if… Your car blew up and you stayed for the whole race.